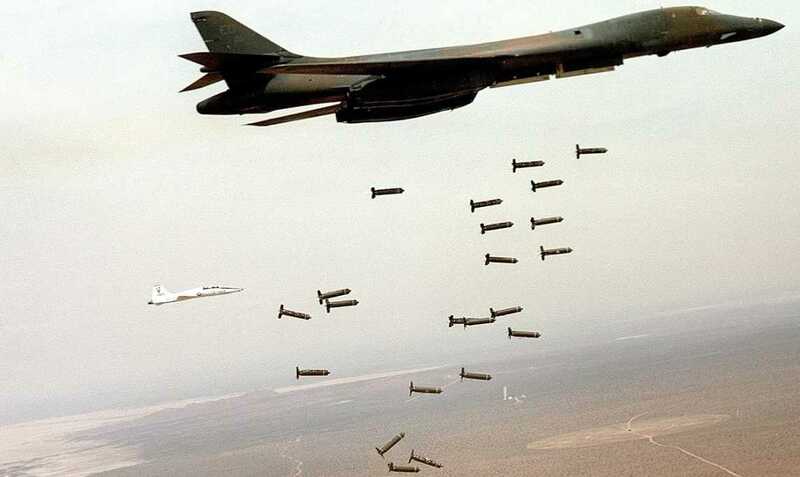 9 Jul 2018 – The US Government (with France and a few other US allies) bombs Libya, Syria, etc. ; and the US regime refuses to accept any of the resulting refugees — the burdens from which are now breaking the EU, and the EU is sinking in economic competition against America’s international corporations. America’s corporations remain blithely unscathed by not only the refugees that are breaking up the EU, but also by the EU’s economic sanctions against Russia, Iran, and other allies of governments that the US regime is trying to overthrow in its constant invasions and coups. The US Government makes proclamations such as “Assad must go!” — but by what right is the US Government involved, at all, in determining whom the leaders in Syria will be? Syria never invaded the US In fact, Syria never invaded anywhere (except, maybe, Israel, in order to respond against Israel’s invasions). Furthermore, all polling, even by Western pollsters, shows that Bashar al-Assad would easily win any free and fair election in Syria. The US Government claims to support democracy, but it does the exact opposite whenever they want to get rid of a Government that is determined to protect that nation’s sovereignty over its own national territory, instead of to yield it to the US regime, or to any other foreigners. The US regime has virtually destroyed the United Nations. The US regime even refuses to provide restitution to Syria for its bombings, and for its arming and training of the jihadists — the fundamentalist Sunni mercenaries recruited from around the world — who are the US regime’s “boots on the ground” trying to overthrow Syria’s Government. Al Qaeda has led the dozens of jihadist groups that have served as the US regime’s “boots on the ground” to overthrow Assad, but Al Qaeda is good enough to serve the purpose, in the US regime’s view of things. The US regime says that there will be no restitution to Syria unless Syria accepts being ruled by ‘rebels’ whose leadership is actually being chosen by the US regime’s chief ally, the fundamentalist-Sunni Saud family, who already own Saudi Arabia, and who (along with the CIA) have been unsuccessfully trying, ever since 1949, to take over the committedly secular, non-sectarian, nation of Syria. In fact, the CIA perpetrated two of the three Syrian coups that were carried out in 1949. The US regime, and its allies, have used the Muslim Brotherhood, in order to recruit into Syria the 100,000+ jihadists from around the world to fight to overthrow Syria’s secular Government. Even the BBC’s 13 December 2013 detailed report, “Guide to the Syrian rebels”, made clear that the “Syrian Rebels” were, in fact, overwhelmingly jihadist and largely recruited from abroad. These were hardly democrats. Even a Tony-Blair-founded anti-Assad NGO’s study concluded that “Sixty per cent of major Syrian rebel groups are Islamist extremists” (not just “Islamists” but “Islamist extremists”) and yet the Blair outfit still supported the overthrow of the committed secularist Assad (just as Blair had earlier participated himself in the US regime’s destruction of Iraq). The fundamentalist-Sunni royal Thani family own Qatar and have been the top international funders of the Muslim Brotherhood, just as the fundamentalist-Sunni royal Saud family, who own Saudi Arabia, have been the top funders of Al Qaeda. The main difference between the Sauds and the Thanis has been that whereas the Sauds hate Shia (and that means especially Iran), the Thanis don’t. Thus, for the Sauds, this is a war against the Shia center, Iran, and not only against Syria. This war against Syria was a coordinated US-Saud-Thani operation, in which the fundamentalist-Sunni group, Al Qaeda, provided the leadership but the (pan-Islamic) fundamentalist Muslim Brotherhood provided the largest recruiting website. This entire hyper-aggressive operation was internationally coordinated. The Obama Administration started planning this operation, under Hillary Clinton, in 2010. As even the neoconservative (i.e., US-empire advocating) Washington Post reported, on 17 April 2011, from Wikileaks, “It is unclear whether the State Department is still funding Syrian opposition groups, but the cables indicate money was set aside [by the Obama Administration] at least through September 2010.” That article mentioned only “former members of the Muslim Brotherhood,” not the Muslim Brotherhood itself; and no mention was made in it to Al Qaeda, in any form. So, this war in Syria has actually been the Sauds’ war to take over Syria. And it actually started in 1949, but the US-backed Muslim-Brotherhood-led “Arab Spring” in 2011 gave the US and its allies the opportunity to culminate it, finally. And Europe receives the fall-out from it. This fall-out has been hurting European corporations, in international competition against US corporations. It’s not only political. The US regime has continued this thrust, under Obama’s successor. US President Donald Trump demands European corporations to end their business with Shiite Iran (which the Saud family is determined to take over), and to end their business with Russia, which America’s own billionaires themselves are determined to take over, just like the Sauds are determined to take over both Syria and Iran. And Europe receives refugees not only from places where the US and some of its NATO allies have recently been bombing, but even from Kosovo, Iraq, Afghanistan, and other places where NATO has bombed in the past, and even from Ukraine, where the US regime perpetrated a bloody coup in February 2014, followed there by an ethnic-cleansing campaign to kill the residents in areas which had voted the heaviest for the overthrown President. Iran and Russia should be Europe’s allies — they didn’t cause any of Europe’s problems. America did. America’s intelligence agencies tapped (and probably still tap) the phones of Germany’s Chancellor and practically everybody else, and yet the US regime has the gall to blame Russia for interfering in the political affairs of European countries. If that isn’t the pot calling the kettle ‘black’, then what is? If anything, the EU’s sanctions should be against doing business with American firms — not against doing business with Russian firms, or with Iranian firms. European politicians who support the US support Europe’s top enemy. Russia is, itself, a European country, which additionally traverses much of Asia, but America is no European country, at all, and yet now is so brazen as to demand that Europe must do America’s bidding — not only against Russia, but also against the Sauds’ main target, which is Iran (the same main target as Israel’s). Why are Europeans not asking themselves: Who is Europe’s enemy in all of this — what causes this refugee-crisis? The refugees certainly didn’t. It’s not Russia, and it’s not Iran, and it’s not China; it is America — which is the true enemy of them all, and of us all — including even of the American people ourselves, because the US Government no longer actually represents the American people. These invasions, and military occupations, and coups, do not serve America’s public; they serve America’s aristocracy. The US is no longer (if it ever was) a democracy. The US Government now is the US aristocracy — not the US public. It’s a dictatorship. And, it has the type of ‘news’media that any dictatorship has. On June 30th, the US aristocracy’s New York Times headlined “Bavaria: Affluent, Picturesque — and Angry”, and reported “the new angry center of Europe, the latest battleground for populists eager to bring down both Chancellor Angela Merkel of Germany and the idea of a liberal Europe itself.” Their elitist (pro-US-aristocracy) ‘reporter’ (actually propagandist) interviewed ‘experts’ who condemn Europe’s politicians that are trying to assuage their own public’s anger against the EU’s open-door policy regarding this flood of refugees from what is actually, for the most part, the US regime’s (and its allies’) bombings — air-support of the boots-on-the-ground jihadist mercenaries. The combination of this air-support, and of the jihadists, has been the backbone of the US-Saudi-Israeli effort to overthrow and replace Syria’s Government. Libya was a similar case, but was only friendly toward Russia, not allied with Russia, as both Syria and Iran are. The US aristocracy funds an enormous international PR campaign for all this. These are ‘humanitarian’ bombings in order to replace a ‘barbaric’ Government — but replace it with what? With one that would be chosen by the Sauds. And this propaganda-campaign is also funded by the US-allied aristocracies. All of the major ‘news’media, in US and allies, receive their ‘expert’ ‘information’ from these privately-funded and government-funded propagandists, who are treated by ‘journalists’ as being objective and experts (which they’re not). So: the Times was secretly (and they didn’t include any links to help online readers know who was actually funding their ‘experts’, at all) pumping NATO propaganda, as if it were authentic and neutral news-reporting, instead of craven service to the US aristocracy that controls the US Government and its NATO military alliance. This is the New York Times, itself, that is “rewriting recent history.” That’s how they do it — constantly (as ‘news’). Though the Sauds, and also Israel’s aristocracy, are mainly anti-Iran, the US aristocracy are obsessed with their goal of conquering Russia. Since Iran, and Syria, are both allied with Russia, the US regime is trying to overthrow those Russia-allied Governments, before going in for the kill, against Russia itself. That’s what all of these economic sanctions, and the bombings and the backing of Al Qaeda for overthrowing Syria’s Government, are really all about. Is this what today’s Europeans want their Governments to be doing — and doing it for that reason, the US aristocracy’s reason? Despite the huge harms it is certainly causing to Europeans? Here, then, is a debate between, on the one hand a retired CIA official who thinks “Our relationship with Israel causes us war with Muslims,” versus Representatives in the US Congress who are actually representatives of Israel’s Government and definitely not representatives of the American people. Both sides in that debate are acceptable to the aristocrats who control the US Government, because neither side argues that the apartheid theocratic Government of Israel is an enemy of the American people (as is documented actually to be the case, here and here), nor that the entire problem of Islamic terrorism is fundamentalist-Sunni, and that only Israel gets hit by terrorism that’s from both Sunnis and Shiites — that Shiites (the US alliance’s targets) are no terrorist threat, at all, to Europeans (nor to Americans) — the “Islamist” threat is actually only from fundamentalist Sunnis, which are the very same groups that are secretly allied with America’s aristocracy and the Sauds. Neither side of the ‘debate’ acknowledges that both the Sauds and Israel (and Israel’s lobbyists represent internationally also the Sauds’ interests) are enemies both of the American people, and of the peoples of Europe. As the world’s greatest blogger, the former UK Ambassador (but too honest to stay in that business) Craig Murray, recently said under the headline, “No Trump, No Clinton, No NATO”: “The destruction of Libya’s government and infrastructure directly caused the Mediterranean boat migrant crisis, which has poisoned the politics of much of the European Union.” But, of course, the US regime and its allies have also destroyed other countries than that — and thus caused refugees to Europe from many nations. And, finally, even the US Government (though as quietly as possible) acknowledges that it has destroyed Afghanistan. Ironically, that’s the very nation where America and the Sauds, in 1979, had started their war against all Governments that won’t buckle to them. Sources inside Syria — both opposition fighters and Syrian military brass (past and present) — suggest the command center consists of the US, UK, France, Jordan, Israel, and some Persian Gulf states. … In practice, the US doesn’t appear to mind the Nusra affiliation — regardless of the fact that the group is a terror organization — as long as the job gets done. These wars, which pour Middle Eastern (and also Ukrainian) refugees into the EU, are inter-aristocratic conflicts reflecting inter-aristocratic competitions; and the publics everywhere suffer enormously from them. The gainers from it are very few but very rich (and they hire very powerful agents in Europe and elsewhere). Those billionaire gainers, and their agents, should be Europe’s targets — not Russia and Iran. NATO must end now. Europe needs to be freed, at last, from America’s permanent-war-for permanent-‘peace’ grip. For Europeans, who are the indirect victims, to be blaming the refugees, who are the direct victims, won’t solve anything, but will simply please the victimizers, as is the public’s ancient habit (to please the powerful). A break must be made, away from that ugly past. European publics must lead the way, or no one will. PS: Since this article asserts such a large number of things that contradict what the US Government and its agents assert, I have sought out and here linked to the highest-quality, least-contested and most highly authenticated, sources and also to sources that link to such sources; all of which, taken together, constitute a book-length proof of the title-case here, that “America Bombs, Europe Gets the Refugees. That’s Evil.” Furthermore, this online virtual “book” is tracking back to the most unimpeachable documents, all of them available merely by means of clicking, and thus without the reader’s needing to visit a huge scholarly library (which might be quite distant); so, the reader can here easily branch out to this entire, and otherwise largely hidden, world of reliable sources, which the US regime wants the public not to know, and certainly not to understand. It’s no longer necessary to be an intelligence-professional in order to come to understand what the regime wants the public not to understand. Investigative historian Eric Zuesse is the author, most recently, of They’re Not Even Close: The Democratic vs. Republican Economic Records, 1910-2010, of Christ’s Ventriloquists: The Event that Created Christianity, and of Feudalism, Fascism, Libertarianism and Economics.